Topics in transformation groups (A. Adem and J.F .Davis). Piecewise linear topology (J.L. Bryant). Infinite dimensional topology and shape theory (A. Chigogidze). Nonpositive curvature and reflection groups (M.W. Davis). Nielsen fixed point theory (R. Geoghegan). Mapping class groups (N.V. Ivanov). Seifert manifolds (Kyung Bai Lee and F. Raymond). Quantum invariants of 3-manifolds and CW-complexes (W. Lueck). Flows with knotted closed orbits (J. Franks and M.C. Sullivan). Heegaard splittings of compact 3-manifolds (M. Scharlemann). Representations of 3-manifold groups (P.B. Schalen). R-trees in topology, geometry, and group theory (F. Bonathon). Dehn surgery on knots (S. Boyer). Geometric group theory (J. Cannon). Cohomological dimension theory (J. Dydak). Metric spaces of curvature greater than or equal to k (C. Plaut). 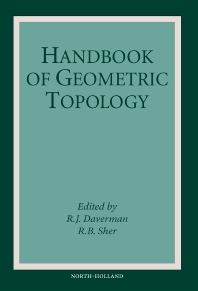 Topological rigidity theorems (C.W. Stark).